With the parents back from their winter trip to Colorado, and the Giant resuming swim team, we all agreed that healthier meals need to happen. The weather is warming up and that also lends itself nicely to lighter meals. So I was trying to figure out what to make for dinner the other night and knew a few things. (1) I wanted something with lots of flavor. (3) I wanted something chock full of veggies but satisfying enough for the men in the house. And that’s when I decided to try something new. 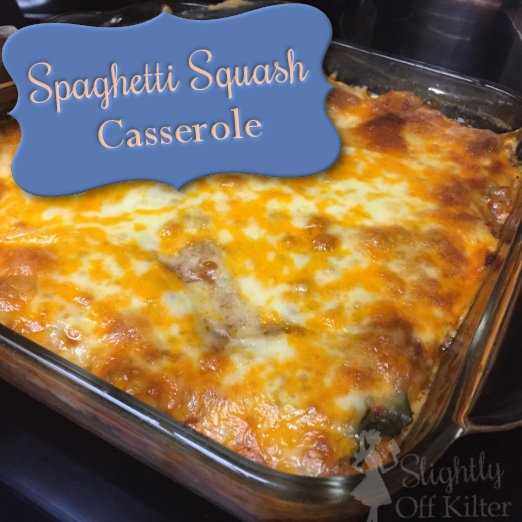 Spaghetti Squash Casserole. We love spaghetti. I think it’s one of my dad’s favorite meals and we always make it with tons of veggies in the sauce. I also love spaghetti casserole – pasta, sauce and cheese all cooked together so that you get the perfect mix in every bite. But pasta and I are on the outs right now so to make a favorite healthier, I decided to sub Spaghetti Squash instead of the noodles. And you know what? It worked! Added bonus? This recipe made enough for another meal so that’s one more night I only have to warm instead of cook! I’m sharing my full recipe, but it could easily be halved or even doubled if you want several freezer meals in one cooking session. Return your sausage to the mushrooms and onions and add in the tomato paste, diced tomatoes, and spices. Let mixture simmer on low while your squash roasts. When the squash has finished roasting, take a fork and shred the spaghetti squash to remove all of the cooked flesh. Add the squash and cubed zucchini to the tomato sauce mixture and stir to combine. Full of flavor and veggies – so much so that even with large salads, the men of the house both went back for seconds. Want to add this recipe to your meal planning rotation? You can easily import this and all of the Slightly off Kilter recipes into the Spinning Meals App!